The air quality in San Francisco is equivalent to the air in Dhaka, Bangladesh, and is believed to be worse than Kolkata, India. Schools and tourist attractions in the San Francisco Bay Area were shut down and residents asked to stay indoors due to the smoke from California's deadliest wildfire. The wildfire air pollution made air quality levels much worse than South Asia's most polluted megacities. San Francisco ordered their cable cars to return to their stations given the Air Quality Index touched 271. This is comparable to Dhaka in Bangladesh and much worse than Kolkata in India. The AQI was recorded at 271, which meant that breathing that air for a day was equivalent to smoking 11 cigarettes. The San Francisco Municipal Transportation Agency wrote on its website, "San Francisco's air quality has moved from red or 'unhealthy' to purple or 'very unhealthy' due to local wildfires and weather patterns." "The Department of Public Health highly recommends that everyone stay indoors and avoid exposure to the outside air," they continued. Eight more sets of human remains were discovered on Friday which put the death toll at 71. Mayor London Breed made an announcement that public buses would be free for a day to make sure that people have access to some enclosed transportation. The iconic and famous Golden Gate bridge was surrounded by thick smog. As reported by Daily Mail, a local resident Melvin Karsenti shared, "It's bad. You have this constant haze over the city. The air feels thicker. I've never seen that many people wear (face) masks." The list of missing persons grew and went from 631 to 1,011 people who are currently unaccounted for, according to authorities. However, officials have maintained that it doesn't mean that 1,011 people are missing. The Butte County Sheriff Kory Honea shared that the list was dynamic and could easily have duplicated names. Honea told reporters, "I want you to understand that this is a dynamic list. The information I am providing you is raw data and we find there is the likely possibility that the list contains duplicate names." He added that on a positive note, around 329 people who were accounted as missing had been found. Searches have been on to look for those who died as well as those who survived the deadliest US wildfire that has happened in a century. President Donald Trump will also be visiting the area to assess the damage. A few of the survivors are not happy with the President who took to social media two days after the disaster to blame the wildfire on poor forest mismanagement. Trump had threatened to hold back federal payments from California. When Trump was asked whether climate change led to forest fires he said, "Maybe it contributes a little bit. The big problem we have is management." Trump told Fox, "You need forest management. It has to be. I'm not saying that in a negative way, a positive — I'm just saying the facts." Rescue efforts are now focusing on Paradise which is a community that houses many retired people who were unable to get out in time. 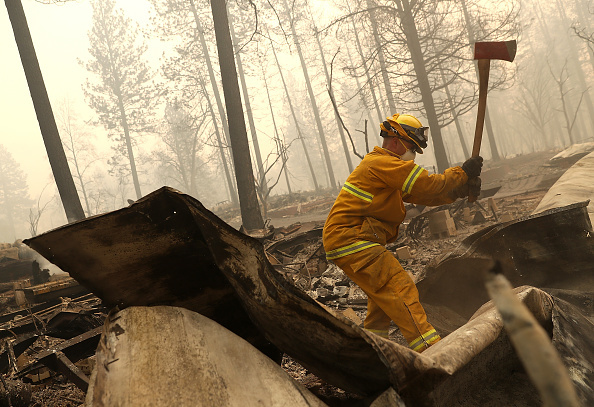 Around 10,000 homes were destroyed in the wildfire.